Although most commonly associated with members of police officer SWAT teams, bulletproof vests are worn by patrol officers, private security, and by anyone needing protection from being shot. Also called ballistic vests, the first modern bulletproof vests were developed in the 1960s for the military, with police first using them in 1969, a year after the development of the first SWAT team. If you’re planning to buy a bulletproof vest for your personal protection, here are the things you need to know. 1 Know the difference between hard and soft body armor. Hard body armor uses plates of metal or ceramic material to stop anything up to a rifle bullet or shotgun slug. Soft body armor uses layers of special fabrics to catch the bullet in flight and disperse the force of its impact. Soft body armor can stop bullets from most handguns, shotgun pellets (up to 12-gauge 00 buckshot), and blunt shrapnel. Hard body armor plates are made of steel, ceramic, or polyethylene. They are highly resistant to impact along the face of the plate, but, especially in the case of non-metallic plates, they are vulnerable to blows along their edges, requiring careful packing when shipped. Soft body armor is made from woven aramid fibers such as Kevlar or Twaron, or resin-impregnated parallel or cross-plied polyethylene fibers such as Spectra or Dyneema. The newer polyethylene fibers are as impact-resistant as the older aramid fibers while being lighter in weight, but they are more vulnerable to environmental degradation. Currently, experiments are being performed with carbon nanotubes as a possible material for bullet-resistant vests, and there are also experiments using gel-like fluids in conjunction with existing fibers to provided added protection at the site of impact. 2 Know the available levels of protection. Bulletproof vests are rated according to the amount of blunt force impact they are capable of stopping. Levels of protection currently available include the following: Level II-A vests are the thinnest available. Generally 4 mm (0.16 inches) thick and made of soft materials, they are designed to be worn under clothing for long periods of time. Level II bullet-resistant vests are generally 5 mm (0.2 inches) thick. They are the vests most commonly worn by patrol officers. They can either be worn concealed under a loose-fitting shirt or over clothing. Level III-A vests are 8 to 10 mm (0.32 to 0.4 inches) thick. Heavier and stiffer than Level II-A and Level II vests, they are designed to stop heavier-grain bullets, such as those from a .44 Magnum, and rapid-fire attacks, such as those from a 9-mm submachine gun. They are designed to handle minor combat situations but can still be worn under clothing if need be. Level III and Level IV vests incorporate 10- by 12-inch (25- by 30-cm) armor plates ranging from 1/2 to 3/4 inch (6 to 25 mm) in thickness to cover the chest and back. Each plate adds 4 to 9 pounds (1.8 to 4.1 kg) to the 3 to 5 pounds (1.36 to 2.27 kg) that the soft body armor vests weigh and reduce the wearer’s mobility accordingly. These vests cannot be worn under clothing and are the kind normally worn by SWAT officers. Stab-resistant vests use armor plates similar to those in Level III and Level IV armor plate vests. (These vests are worn by corrections personnel to protect against being stabbed by prisoners with smuggled-in and improvised knives and stilettos.) Stab-resistant vests are rated according to the energy of impact they can deflect. As do the plates in Level III and IV bulletproof vests, they add weight and bulk to the vest, reducing mobility; they can, however, be worn under clothing. Pending the outcome of further research, the plates may be replaced with the gel-like fluids described above. Some bullet-resistant vests are designed to allow the wearer to insert additional armor plates to add layers of protection. 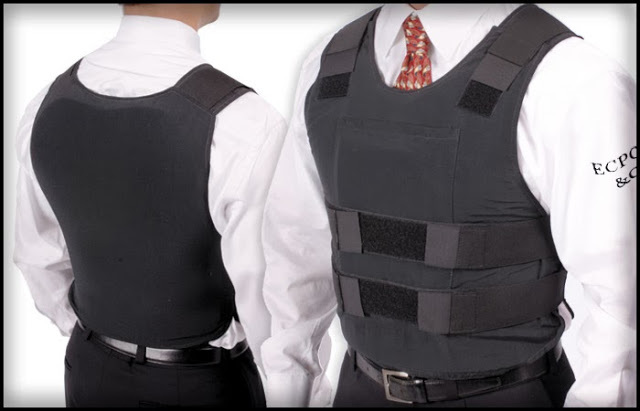 These vests can accommodate armor plates to make a vest stab-resistant as well as bullet-resistant, as soft body armor can protect only against slashing knife attacks, not stabbings. 3 Decide whether or not you want a concealable vest. Level II and Level II-A vests can be concealed under a thick, loose shirt or a thinner dress shirt and undershirt. Level III-A vests may require a sweater or suit jacket to be concealed effectively. However, Level III and Level IV vests require at least a heavy jacket or sweater to be concealed or a battle dress uniform, and they are usually worn over clothing.A vest worn under clothing is often white in color, so that it can be mistaken for an undershirt if you normally wear your shirt with the top button unbuttoned. A vest worn over clothing is usually dark in color. 4 Choose a vest that fits you. A bulletproof vest should fit you reasonably comfortably. Too large a vest will be ill-fitting and tend to slip, while too small a vest may expose vital organs to injury. Some manufacturers make bullet-resistant vests only in standard sizes, which may be a problem if you buy online and can’t be fitted before you buy. 5 Consider your budget. Not only do additional layers of protection add weight to the bulletproof vest, they also add to its cost. However, some body armor dealers resell used police vests to private security and civilians. Used body armor has been tested by the National Institute of Justice and found to be as bullet-resistant as new armor. Aramid fibers such as Kevlar and Twaron last for many years; however, the fabric in the outershell carrier may wear out faster in a used vest than a new vest. You’ll also have to replace the elastic in the carrier sooner in a used vest than a new one. Some dealers offer volume discounts for multiple purchases, which may be important if you’re outfitting a mall security force or group of bodyguards. Consider the guarantee offered by the seller, as well as the manufacturer’s warranty. Keep body armor clean and dry. Sprinkle a little foot powder onto the panels after cleaning with a cloth soaked in water and squeezed vigorously (and repeat). If your body armor is equipped with a trauma plate, be certain that it is used. Uncomfortable slightly, but will save thorax from impact shock, and worth it.